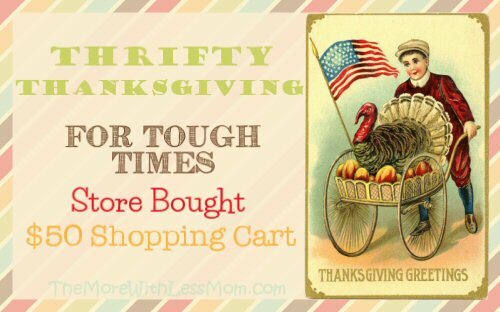 Use this frugal shopping list to spend $50 and purchase store bought items for your Thanksgiving meal, making smart decisions in tough times. If you are descending on someone bearing gifts this is a great list. The problem with this store bought list is that it isn’t a lot of food. It’s one box of stuffing, one can of cranberry sauce, etc. It is a taste of a lot of things, and a bunch of turkey. Also there were no prices on some items premade so I picked the most similar product, like the green bean casserole is just a frozen bag of green beans with fried onion in it.